Here’s a nice story. It shows that hard work combined with the right business strategy can lead to amazing success. And yes – it really did start in a garden shed! Speedy Freight is the name of the company and the strategy for growth they used? Well, franchising of course. This story is a perfect demonstration of how franchising can help businesses overcome these types of hurdles to achieve rapid growth. They sought professional advice at an early stage from an experienced franchise consultancy – in this case, The Franchising Centre. They recognised right from the start that ultimately they wanted to franchise the business, so they took advice and developed the business in a way that would make the franchising process simple when the time was right. Speedy Freight is a same-day courier business that was started by Ian Southworth and Mike Le-Gallez in 2006. With much ambition but a tight budget, they started trading from old horse stables at the bottom of Ian’s garden in Knutsford. Ian brought a wealth of experience in logistics gained from the ground up, starting as a courier driver when he left school. Mike brought sales and management experience from a previous role as a Regional Sales Manager for a management company. The first 6 months were tough – it required a strong sales approach to bring clients over from their existing courier companies to a brand new start up. 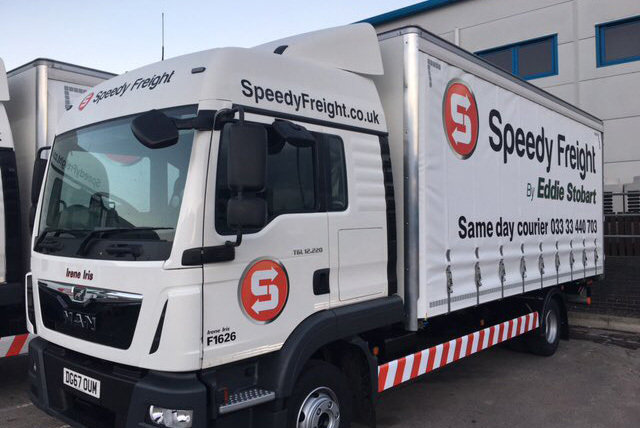 By being tenacious and focussing on specialist sectors, Speedy Freight slowly started to build their portfolio of regular same-day courier clients. In addition, they recognised that if they made the effort from day one to organise and systemise their operations in an efficient way, they could in the future pass that way of operating to their franchisees. The model was to be effective but simple – an efficient office offering excellent client service by concentrating on serving those clients and managing logistics and an excellent standard of drivers and vehicles by recruiting self-employed drivers that were fitted out and trained in an at-cost package to serve fully liveried and uniformed under the Speedy Freight brand. By their 18th month, Speedy Freight had grown to a turnover of more than £600,000, almost doubling to £1.1m by their second full year. In 2010 and with a turnover of £1.5m, they felt they had ‘walked enough of the walk’ to prove the model to franchisees, pass on a huge amount of time-tested experience and to develop the high standard of franchise they had always intended for the brand. Working with The Franchising Centre, Speedy Freight developed an effective franchise model that would be more lucrative for franchisees. Infrastructure, systems and a high level of support were developed to support franchisees that would replicate the head-office model rather than to franchise individual courier drivers like other competing franchisees. The franchise started to roll out in 2011 and was an instant hit. Even the slowest developing franchisees were reporting sales of £10,000 per month from their fourth month which was to do, in the large part, with the very high levels of initial on-site support that Speedy Freight offers – getting their sleeves rolled up to help develop a strong initial base of regular customers for franchisees by going out with them into the market and ‘knocking on doors’. By the end of the second year of franchising, 10 successful franchisees were trading, bringing Speedy Freight some £350,000 in joining fees and increasing network turnover by up to £2m, with more than 300 subcontracted drivers dedicated to the brand and hundreds of others serving excess and specialist vehicle trips on an ad-hoc basis. By 2015, Speedy Freight had 30 franchised offices that offer national coverage. The franchise continues to grow from strength to strength and having joined the British Franchise Association continued to add franchised offices. Eddie Stobart is a major player in the sector with a group turnover of more than £600 million and profits of nearly £70 million. Speedy Freight demonstrates that with a tenacious approach, hard work and the right specialised advice from consultants like The Franchising Centre, you can dare to dream. Speedy Freight did and in less than 10 years has grown from hard working friends working from the bottom of the garden to a leading national business and franchise – something they were only able to achieve through the power of franchising and the accelerated national network of quality offices it allowed Speedy Freight to build. Speedy Freight now has 81 branches nationwide and are still seeking franchisees around the UK.